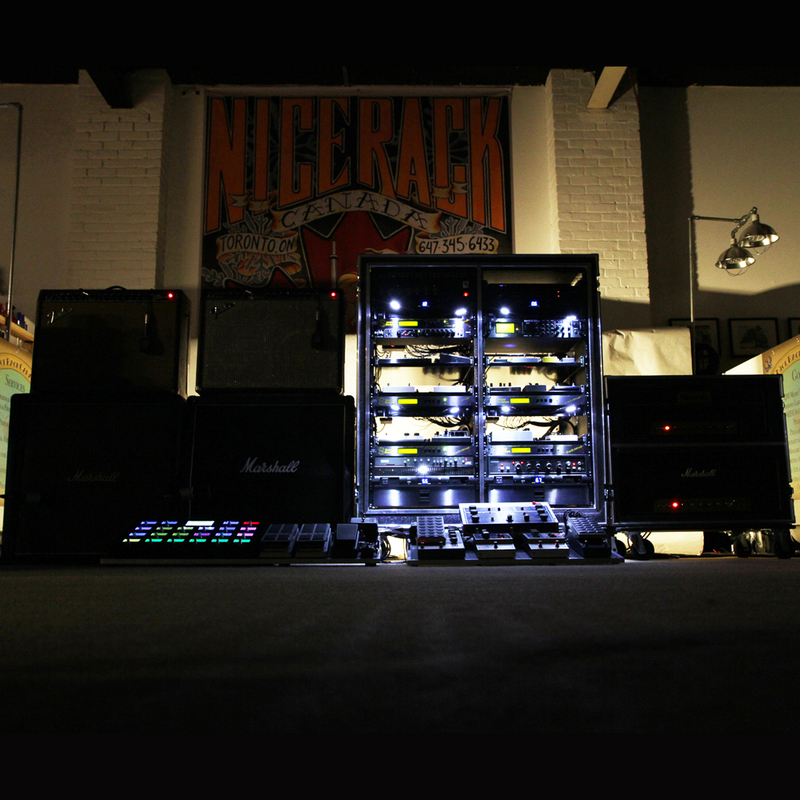 Perhaps the most powerful system we've ever built.. Instead of being tied to one signal flow you can have any signal flow you want, when you want. Which is pretty handy for score music composer & guitar instrumental musician who has to constantly change the signal flow. 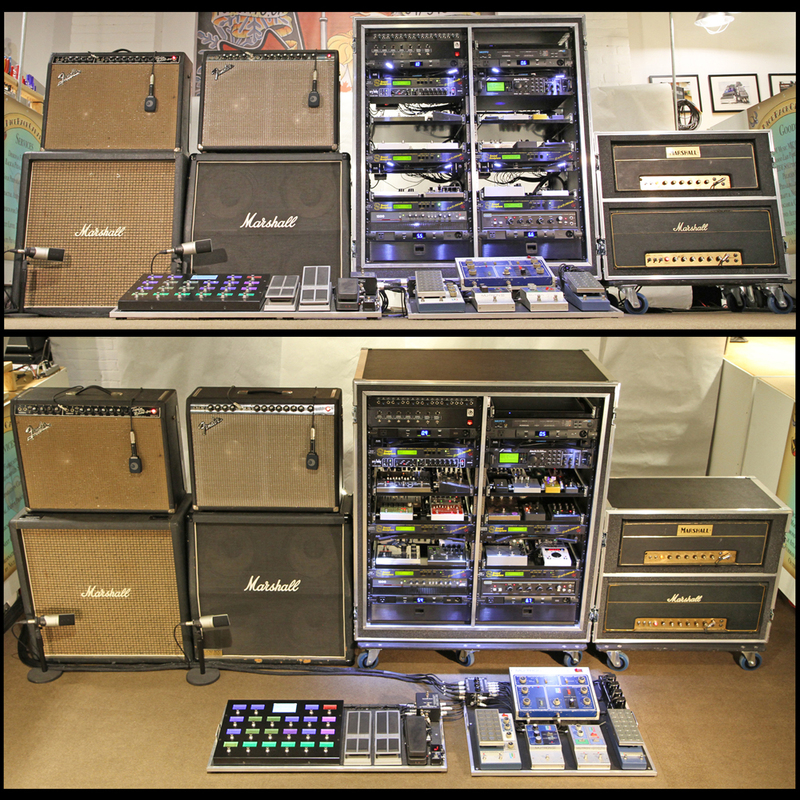 This pedalboard is kind of like a collection of Faberge´ eggs… but infinitely cooler! 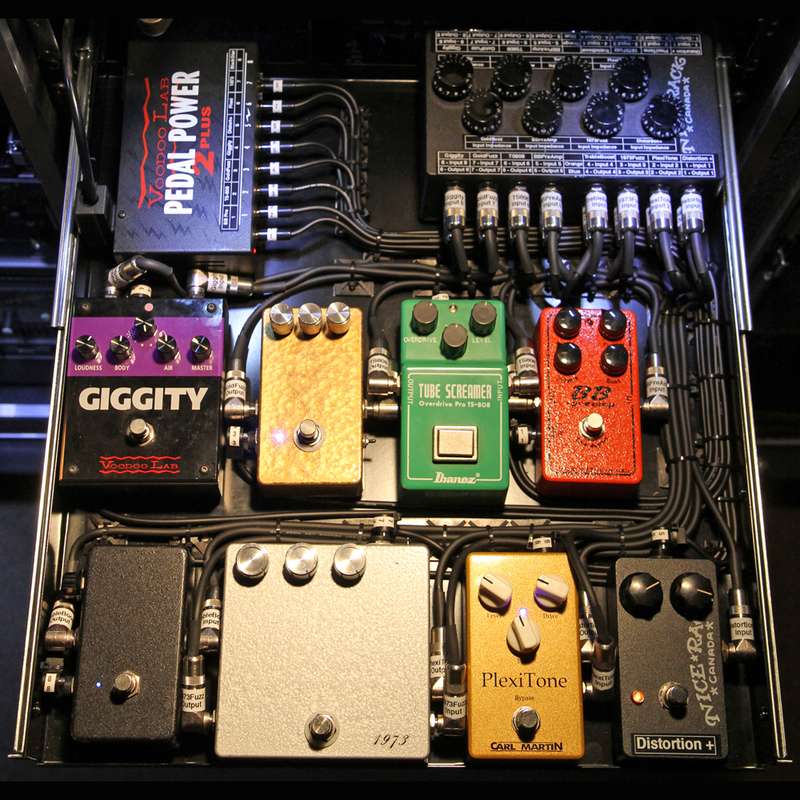 This pedalboard is but one of the effects "modules" to the "Infinity" rack system we built for The Rose Room Recording Studio﻿. 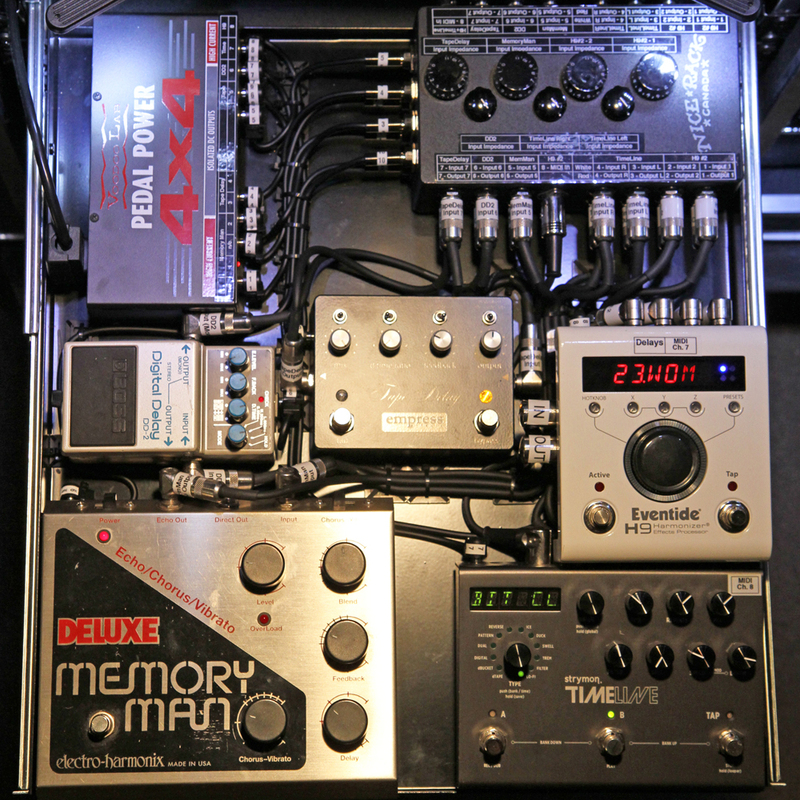 This pedalboard has audio connectivity to 3 of the Matrix Switchers in the rack. The Octave Divider is grouped with the Overdrives & Fuzzes. The III Filter is grouped with other Filters, Synths, EQ's & Compressors. The BiPhase & Flanger are grouped with other Modulations. 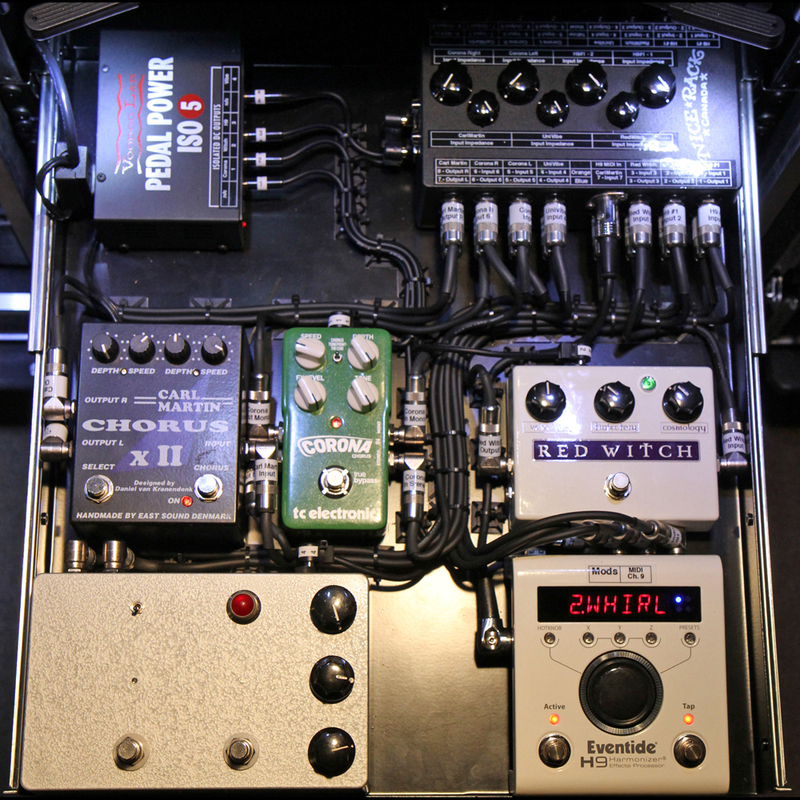 The latching connection "In & Out" box on the top left also contains a passive Impedance adjustment circuit for each effect device's input. The Matrix switchers have an Input & Output impedance of 1mOhm, which is nice for loading the output of the guitar or effect device but not always so nice for the input side, particularly for Harmonic overtone type devices. With this circuit we can sweep the input impedance down to 10kOhm, mimicking the impedance relationship of plugging a guitar directly into the device, while the switcher allows infinite signal flow combinations. Having your cake and being able to eat it too, is indeed sweet. 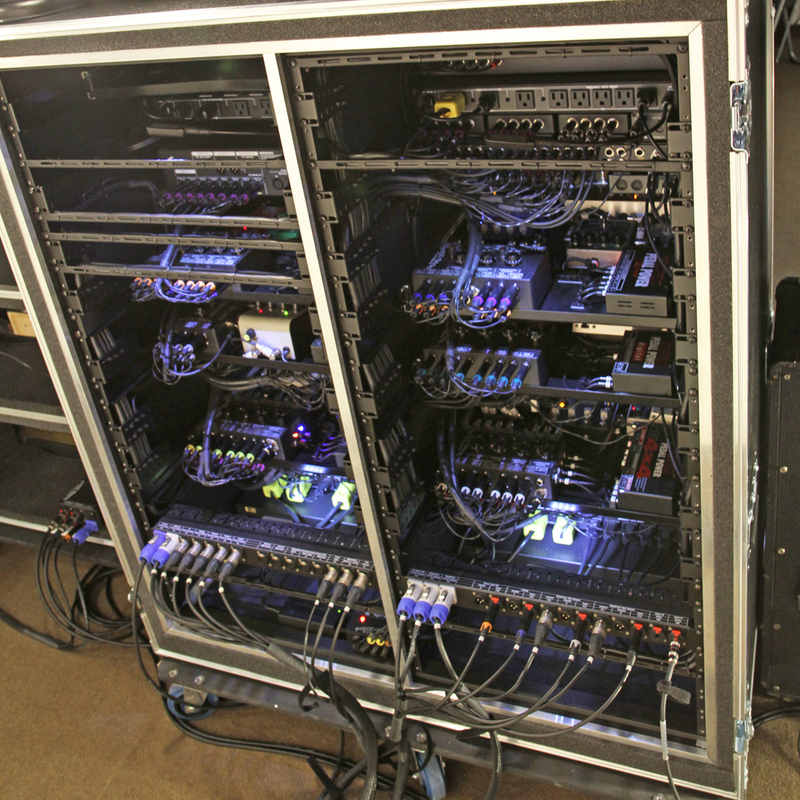 A plethora of ways to have it all come back again, 1 of the Matrix Switchers in the rack is connected to nothing but delay units. The delay pedals in the drawer are a ElectroHarmonix Memory Man (24 Volt version), Strymon TimeLine, Eventide H9, Empress Tape Delay & a Boss DD2. Not pictured but also connected to the Delay Matrix is an ART1500 & the "back side" of an Axe FX II in a 4 Wire Configuration for the Delay, Reverb & Looper blocks. 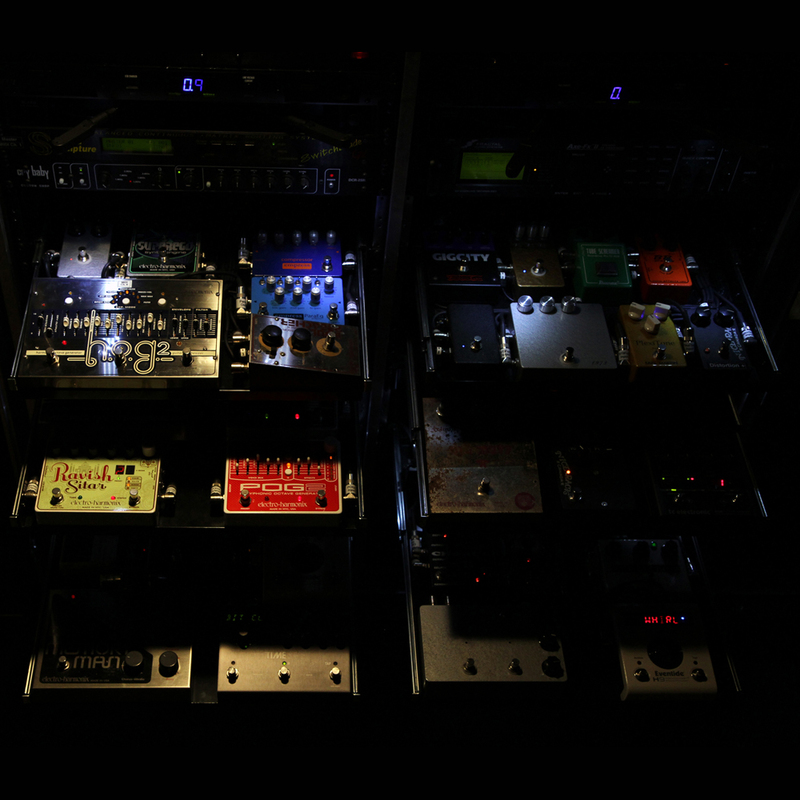 Inside drawer #2, we have some modulation effects connected to the "Mods" Matrix Switcher in the Infinity Rack System. Featuring the Carl Martin Chorus, TC Electronic Corona, Red Witch TremoPhaser, Steve Moratto UniVibe & an Eventide H9. Not pictured here but also connected to the Mods Matrix is the Mutron Flanger & BiPhase on the previously pictured "Mu Board". 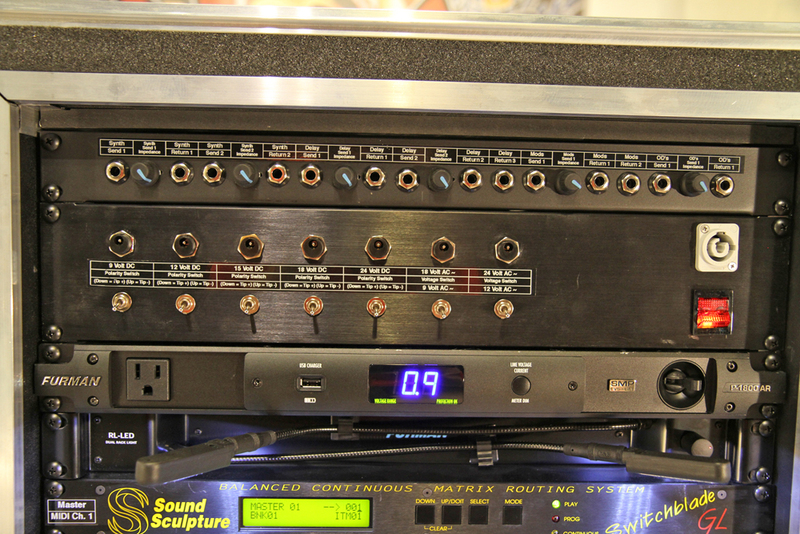 Also connected is an MXR Flanger / Doubler Rackmount in pristine condition. From Queens comes the King of Cool, Mike Matthews should be proud! 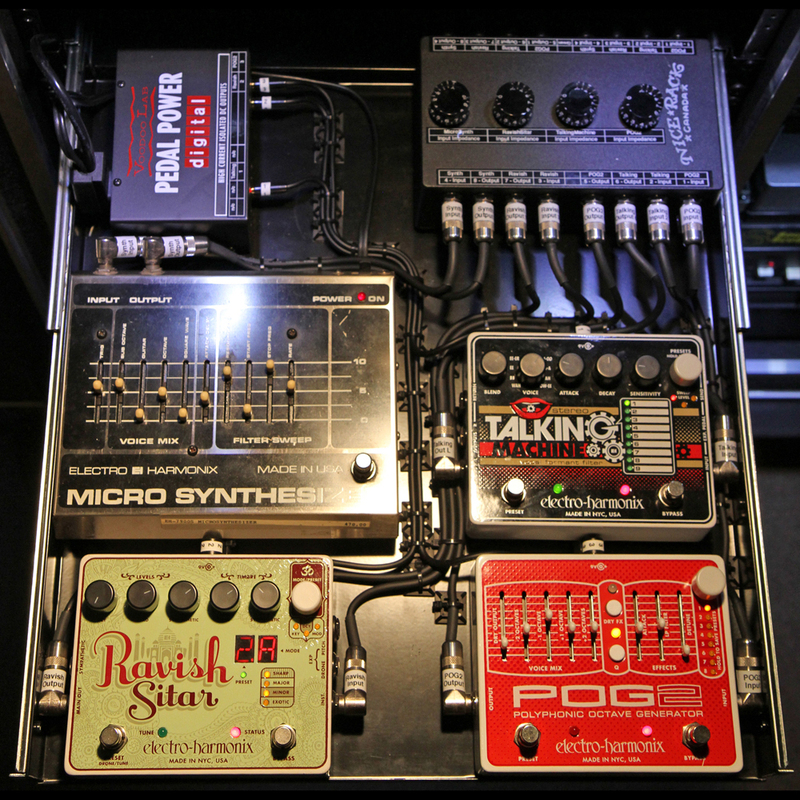 Connected to the "Dynamics" Matrix in the Infinity Rack System, this drawer features some Electro Harmonix classics, the original Micro Synth, a Talking Machine, drone & sympathetic madness from the Ravish Sitar & one of the most iconic pedals of this century so far, the POG2. 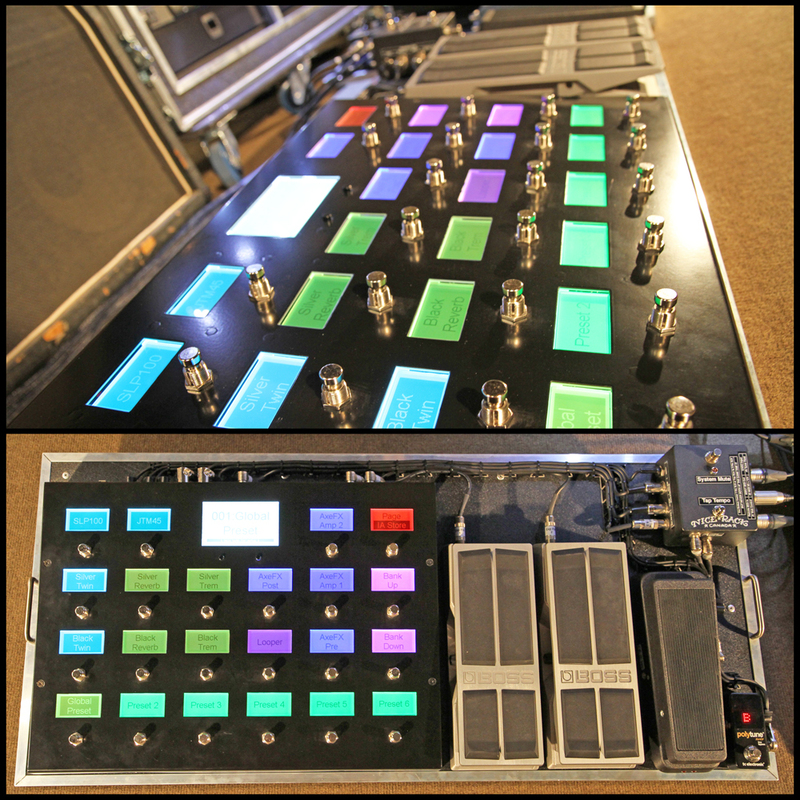 The 2nd drawer of effects for the "Dynamics" Matrix, the switcher where we synthesize & sculpt the signal. 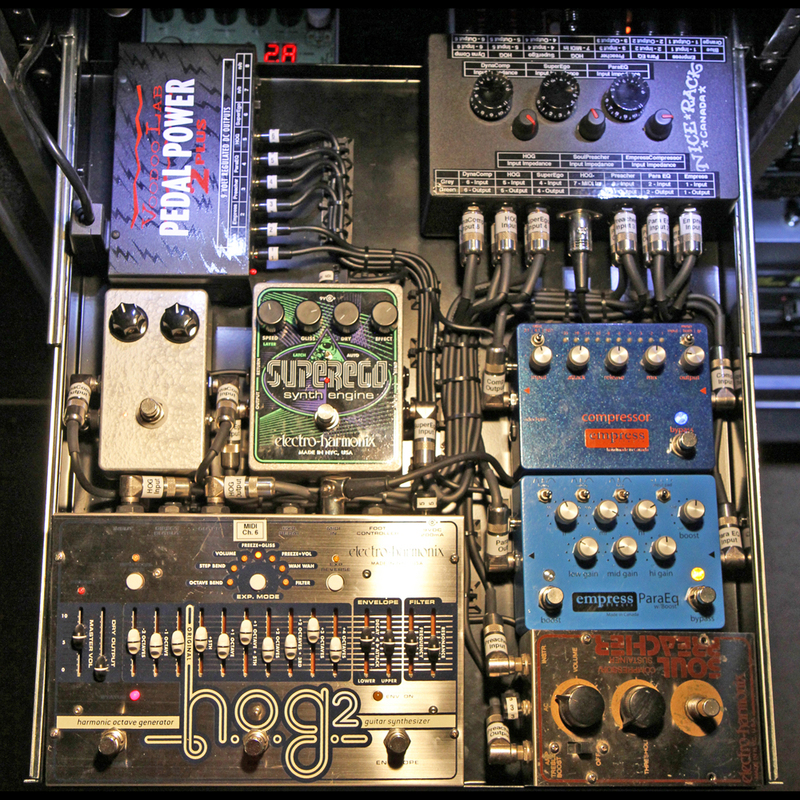 Featured in this section are the Electro Harmonix HOG, Super Ego Synth Engine & Soul Preacher Compressor. Empress Effects makes some damn fine Canadian pedals including the pictured Compressor & ParaEQ. The silver box is a Steve Moratto Dyna Comp. 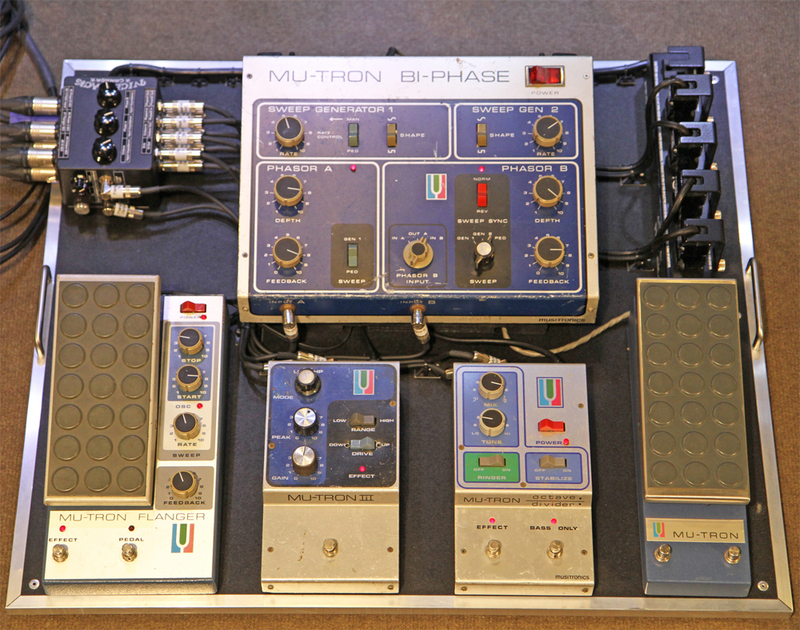 Not pictured but also connected to this matrix is a Dunlop Rack Wah & Mutron III Filter. With multiple connection paths from the Harmonic to Master switchers, assigning different pedals to different amplifiers is a mouse click away, allowing the player to stack multiple tracks in real time with zero compromise in tone or creativity. 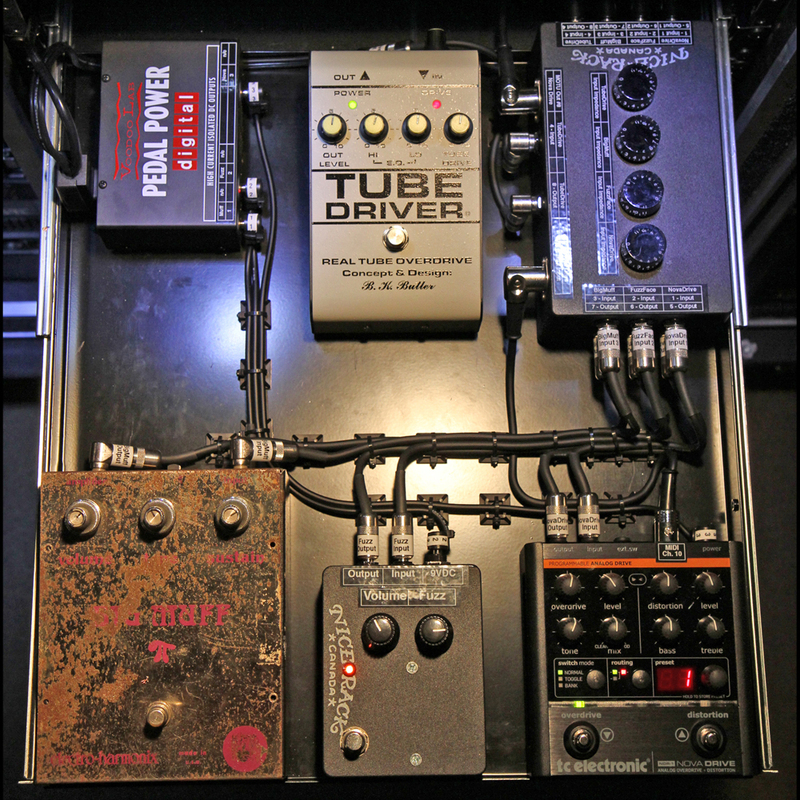 Some of the absolute classics live in this drawer, a Butler Tube Driver, an Electro Harmonix "Rams Head" Big Muff, a rehoused Dunlop Fuzz Face & the workhorse TC Electronic Nova Drive. Featured are a mint Ibanez TS-808, a rehoused script logo MXR Distortion +, Steve Moratto built up a Vox Treble Booster copy (black box), 1973 Fuzz & Gold Fuzz, the fast becoming legend Xotic BB Pre, a Carl Martin Plexi Tone & one of the most versatile & utilitarian pedals on the market today, the Voodoo Lab Giggity. 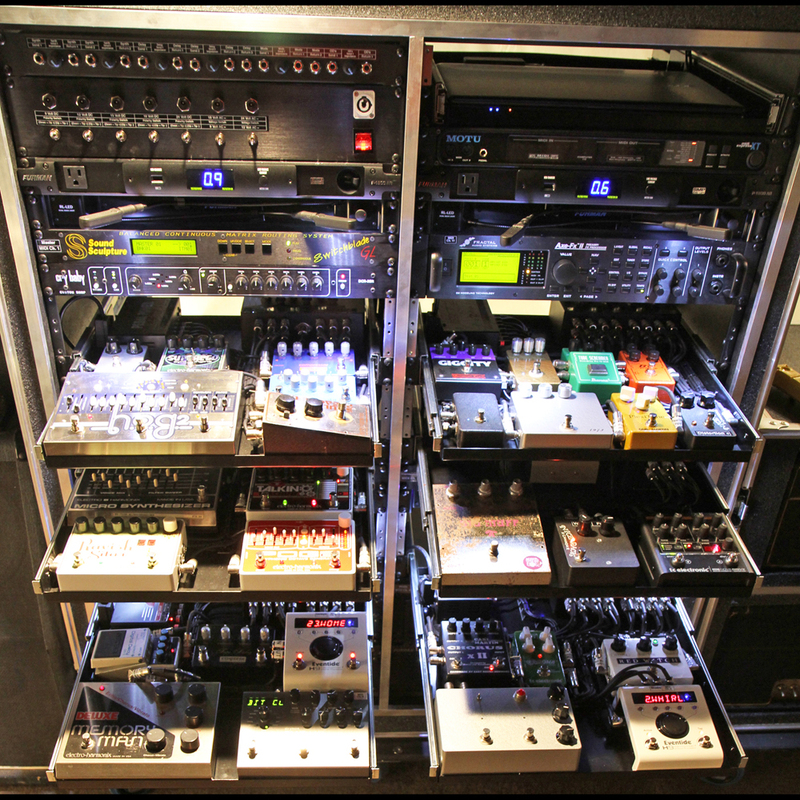 Not pictured but also connected to the Harmonic matrix are a Mutron Octave Divider and a Fractal Audio Axe FX II. To provide for any possible power requirement for the External effects devices we constructed this power supply module that can provide 9, 12, 15, 18 & 24 Volts DC in Tip Positive or Negative polarity all at 2000mA of current. There are also outputs of 9, 12, 18 & 24 Volts AC at 2000mA of current. Given the vast array of effects devices over the last 40+ years, we thought it beneficial to have a power supply that addresses every single known voltage & current demand. Both of the important generations of Fender Twin Reverb are on display here. A lovely little Marshall JTM45 & a SLP100 with a history complete the "daily" array. By daily we mean that the amplifier choices to complete the rig also include a Fender "Blackface" Tremolux, TRVR Handwired Little Boy & Plexi, Komet 60, Marshall JTM45 Combo with more additions coming. The SLP100 was previously owned by Dave Sabo of Skid Row and used on a number of the band's recordings. Perhaps there's a few hits in it for you too. The only way to find out is to book yourself some time at The Rose Room Recording Studio for a session with the Infinity Rack System. Last edited by Vegas on Sun Jun 11, 2017 9:45 am, edited 1 time in total. Awesome planning and execution there! That is one hell of a setup!